Alright, so here's the deal. We all remember from Season 5 when we were shown the time flashes that one of the flashes involved everyone moving to the future. We saw the beach camp was deserted, and there was an outrigger with an Ajira water bottle in it. Locke & co. took the outrigger, and headed around the island. While they were doing that, another outrigger came up behind them and started shooting at them, right before they flashed to another time period. So, we knew it was the future. But we don't know when, and we don't know who was shooting at them. Damon & Carlton have come out and admitted that they knew at the time who was in the other outrigger, but the way things ended up playing out in Season Six, it wasn't possible for them to get the people they wanted together into that boat, so the scene never made it into the show. So that leaves us with the problem of what to do with the time flash, since we ultimately don't know when it took place. Now, there is no correct answer, because there's no particular place in the story that we were shown where this scene really could have taken place. Therefore, I chose to improvise. I decided that the most likely group that might be shooting at them would be Ilana's people. Widmore's people never really spent a lot of time on the boats, and when they did it was mostly just going back and forth between Hydra Island and the Main Island. Now, the one logistical problem here is that Ilana's people had the great big mystery box attached to one of their outriggers, and it's very clear that the outrigger we saw had no box with it. But, all things considered, I felt like that was the best place to put it. Anyways, back to the episode, we see Locke, Sun and Ben arrive at the Others' camp on the beach. Locke has Richard and Ben join him on a trip into the jungle. We get the last of our time flashes, right after Locke had been shot by Ethan. Present day Locke has Richard go to past Locke and help him with his bullet wound, and also to give him the compass that Locke gave Richard back in the 1950s. He tells him that he has to get everyone off the island to come back, and that he's going to have to die in order to do it. Richard goes and does all of this before Locke & co. flash again. They head back to the Others camp, and Locke insists on going to see Jacob, and he wants to take everyone with him. Locke starts planting the idea into Ben's head that he needs him to kill Jacob. Ilana and her crew makes it to the main island, where they find Jacob's cabin. The ring of ash around the cabin is broken, and the inside of the cabin is empty, except for a handmade picture of the statue of Taweret. 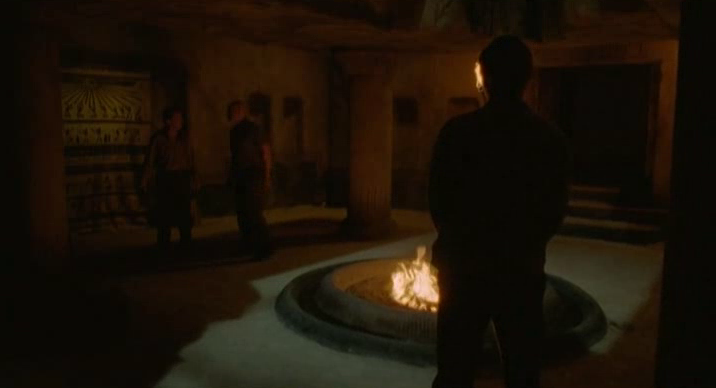 Locke arrives at the foot of the statue of Taweret, and takes Ben inside to see Jacob. Ilana and her crew arrive at the foot of the statue, where they show Richard what's inside the large box they've been carrying: the body of John Locke. Inside the statue, we see Jacob, and discover that Locke is not who he claimed to be. He is the Smoke Monster, and he uses Ben as his weapon, to have Jacob killed. Ben stabs Jacob, but before he dies he tells Locke that "they're coming". The episode runs 49:56 and is 426MB to download. You can stream the episode below (via Facebook), or go here to use torrents (better quality, recommended) to download the episodes to your computer. "December 18? - An away team of six men was launched at first light in an attempt to get to the island with hopes of determining our location. Only one returned alive. He seems in a deep shock, muttering about exchanging musket fire with another vessel which promptly disappeared in a flash of heavenly light." it might indicate that this away team experienced time-flashes of their own, at one point encountering our favorite time-flashing losties... if this is the case, it matters not exactly where it is placed, so long as it is after the Ajira crash. additionally, in this post-Ajira flash era, there are 3 outriggers available to this new crew (as stated by Caesar when they first arrive)- the first is taken by Sun and Lapidus; the second is commandeered by Ben and Flocke; the third taken by Ilana and her crew, with Locke's body in the crate. none of these ever encountered fire, further indication that it was another outrigger entirely. we've seen a 4th throughout the show, used by Kate & Sawyer, Karl, Desmond & Charlie, and more (http://lostpedia.wikia.com/wiki/Outrigger_canoes). one has to question: where did these vessels originate? they seem to have been around a while, so it very well could have been a group of folks we simply never met! @shauniqua Thanks for all the outrigger info! I like your perspective on things.